White PVC pipe system suitable for industrial use as well as swimming pools, hot tubs and spas. Currently in Stock for next day delivery. 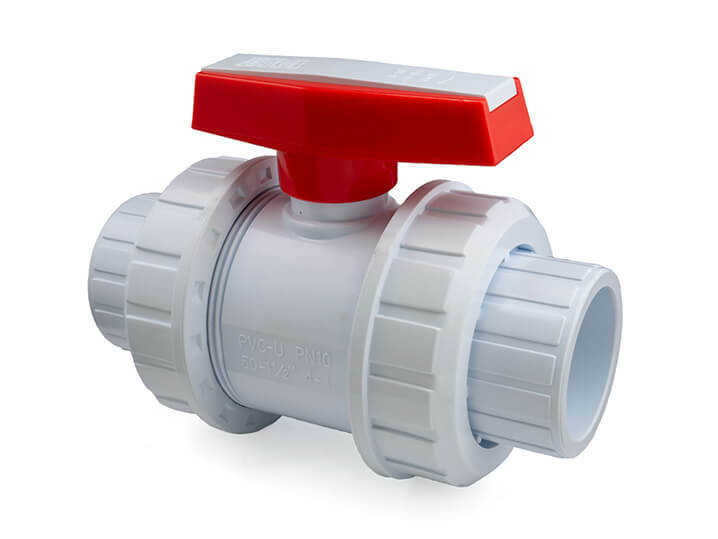 A double union ball valve has a union on either end. These unions enable the valve to be unscrewed and removed from the pipeline quickly and easily. The process of returning the valve to the pipeline is just as quick and easy. Double union ball valves have a full-bore flow and so are unlikely to catch any debris and get blocked. Double union ball valves have a handle to control the flow, but they only allow for a quarter turn between fully open and fully closed. If you need a finer control than this on your flow, we recommend looking at a gate valve. All our valves are pressure tested to 10bar pressure. They are also wet tested at the factory before they come to us.